Name: Alec Cooke Partners: Erik MacPherson and Ben Murat Experiment Date: November 6th 2008. 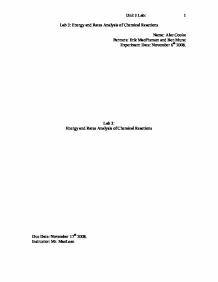 Lab 3: Energy and Rates Analysis of Chemical Reactions Due Date: November 17th 2008. Instructor: Mr. MacLean Questions (i) How does the molar enthalpy of reaction of magnesium vary with different acids, namely, hydrochloric, sulfuric, and acetic acids? (ii) How does the rate of reaction of magnesium vary with these acids? Hypothesis If magnesium is mixed into any of the aqueous acid solutions, it is predicted that there will be fizzing and bubbling. This bubbling will be due to the release of Hydrogen gas, which is produced when the hydrogen bonds are broken and replaced with the magnesium. It is hypothesized that the test tubes will be warm, because the reaction is exothermic; therefore it releases energy, or heat into its surroundings. It is also expected that the carboxylic acid (Ethanoic acid) will have a faster rate of consumption for magnesium, because its carbon base will allow it to let go of its hydrogen atoms more readily than hydrochloric and sulfuric acid. The molar enthalpy for Magnesium should only vary because of human error. ...read more. Ideally the three molar enthalpies should be the same, because the molar enthalpy for magnesium is dependant upon magnesium, not the other reactant. (In Ethanoic acid: 2.8E2 kJ/mol, In Sulfuric acid: 3.5E2 kJ/mol, In Hydrochloric acid: 3.5E2 kJ/Mol) Q: How does the rate of reaction of magnesium vary with these acids? A: The rate of reaction varies noticeably in the three acids. The rate was fastest in Sulfuric acid, at 5.29E-5 mol/s, second fastest in Hydrochloric acid at 1.87E-5 mol/s, and slowest in Ethanoic acid at 7.61E-6 mol/s. Since the surface area of the magnesium and the temperature of the acid was essentially the same in every sample, the only reason that the rates would vary this much is due to their different chemical properties. Evaluation As predicted before the experiment, there was a lot of fizzing and bubbling during the reaction. Also, as predicted, the system increased in temperature in all segments of the experiment, due to the exothermic nature of the reaction. Contrary to the hypothesis, the Carboxylic acid had the slowest rate of reaction with magnesium. This could be due to the slight polarity of Ethanoic acid. ...read more. A way to control the exothermic nature of this reaction would be cooling it down as the reaction goes on. Adding more Freon or ice to the surrounding atmosphere to absorb the heat given off by the reaction. Not enough to cool down the solution, just enough to keep it at a stable temperature. Something like this would be effective in providing heat in a hand warmer, but for multiple reasons, unsafe. In order to generate enough heat to keep somebody's hands warm in the winter, the acid would have to be pretty concentrated. This concentrated acid would be a hazard to the person if it ever leaked, caustic acid can cause irritation to skin and in some cases severe burns. Also there is a considerable amount of hydrogen gas produced in this reaction, which needs to go somewhere. The package with the acid and Magnesium in it would have to have ventilation for the gas to escape. This would be a place for the acid to leak out also. Acid and magnesium is not the ideal exothermic reaction to provide heat for hand warmers due to the risk of acid burns. 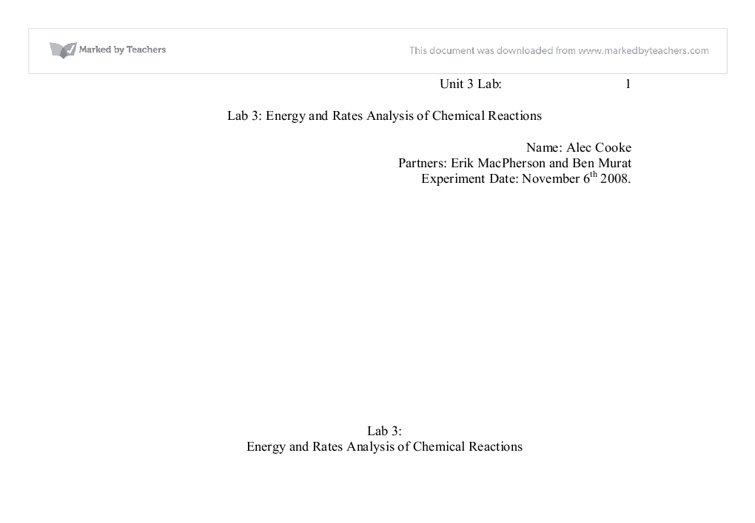 Calculations 1 Unit 3 Lab: Lab 3: Energy and Rates Analysis of Chemical Reactions ...read more. They are also inexpensive and do not need to be handled with care. 9 * Beaker A 250 cm3 beaker will allow us to mix the solution properly. It is big enough to mix the solution properly and avoid any solution spilt, what will make our results more reliable. During the experiment our Magnesium strip began to glow a red and orange colour. This is a result of the heating and the thermal energy. After we stopped heating the magnesium strip, we discovered that there was a drastic change in its appearance. The solution was then titrated with the standard (approx. 0.01M) dichromate solution. Just before the end-point, the color of the solution was changed from colorless to grey-green; at this point the dichromate solution was added dropwise until the violet color persisted throughout the solution and this was taken as the end-point.